Small- to mid-sized businesses. Entrepreneurs. Visionaries. Our clients include a wide array of professionals, commercial and investment property owners, pilots, community leaders, and retired individuals. In one of the most difficult economic and lending environments in history, your creativity and expertise allowed us to access over fourteen million dollars in low fixed-rate, long-term capital. Is it possible to pull off a $20 million auto dealership expansion in a struggling economy? Ask Joe Billion. Joe had spent more than a decade dreaming and planning for the expansion when we first met in 2010. He had tried to obtain financing through national and local banks, but needed one that understood the scale and depth of his project, one that was at home with complex financing structures. Enter Tom Swenson and Daniel Day, a pair of banking experts that gave Billion renewed hope that his project was viable. Billion was bullish on the local and national economy and determined to get the project done, and with Bank of Montana, he found the perfect match for his optimism. Bank of Montana has been able to get done what other banks simply cannot do, or don’t know how to do. They are the cutting-edge bank for business-minded individuals or companies. 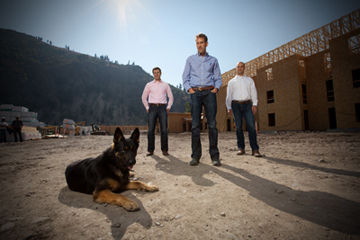 Ask our partners at Rocky Mountain Development Group in Missoula: When it comes to real-estate financing, Bank of Montana often only has the solutions. In the United States there are only 89 HUD-approved MAP (multifamily accelerated processing) lenders, and Bank of Montana stands alone in offering this ability across a six state region. We offer long- term, fixed-rate, non-recourse financing on projects like Silvertip Apartments. Being able to offer these products gives you long-term stability as the foundation for the growth of your business. As the leading multifamily housing lender in the region, we specialize in loans utilizing Fannie Mae, Freddie Mac, and the Federal Housing Administration’s multifamily loan programs, so you have an array of options when the time comes to finance your project. Our partnerships have helped create more than 700 units of housing for all kinds of families in Missoula, Montana alone. That kind of business helps everyone.